SMI supplies a kit for replacing the mold-holder, including the left side and the right side, as well as all the necessary components for reassembling it, as shown in the above picture. The supply of both the left and the right side in the replacement kit (code ZF010098) even in case of request of one side only, is due to the fact that the mechanical coupling of two components with a different level of consumption (a new one and a used one) might cause the transfer of the mechanical lash from the old part to the new one. Therefore, the coupling would not be correct during the blowing station opening and closing phase and would cause the break of the new component. As a consequence, it is necessary to replace the whole mold-holder group. 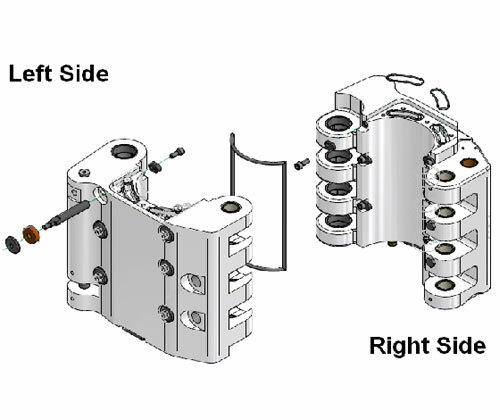 We would like to point out that the replacement of this component is very complex and implies a series of adjustments of the blow-molder planarity (resetting the planarity of all blowing stations and resetting the bolt closing system) which require SMI qualified personnel in order to be executed correctly. The intervention of SMI specialized technicians is necessary, in order to ensure a correct assembling of the new component and a long-life duration. The assembly of this component by personnel not officially authorized by SMI shall imply the termination of the warranty conditions according to which SMI is operating.